Welcome to the Winter Solstice 2016 issue of Eternal Haunted Summer! 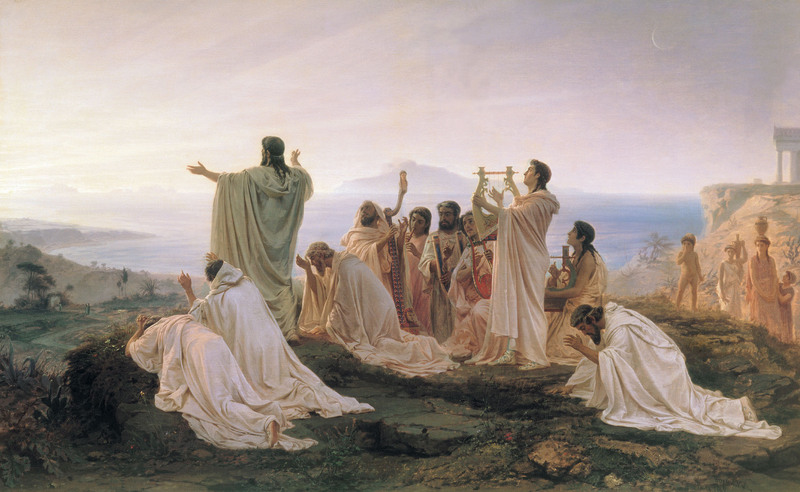 In honor of the season, here is “Pythagoreans Celebrate the Sunrise” by Fyodor Bronnikov. In Fiction, Gary D. Aker returns to EHS with the eco-mythological “New Servant of the Hive.” Allister Nelson debuts with the Greek-inspired “Prometheion,” which explores what happened after Prometheus left Olympus with that stalk of flame. Gerri Leen also looks to Hellenic lore for her modern take on an old tale in “Sepulchre for the Stolen” (note: adult content). In Interviews, we sit down for a Fast Five with Deborah Davitt, author of the magical alternate history series, The Edda-Earth Saga. Finally, Reviews! Evelyn deShane delves into Arc of the Goddess by Rachel Patterson and Tracey Roberts, and Fairycraft: Following the Path of Fairy Witchcraft by Morgan Daimler. Erin Lale looks at the The Encyclopedia of Norse and Germanic Folklore, Mythology, and Magic by Claude Lecouteux; Icelandic Magic: Practical Secrets of the Northern Grimoires by Stephen E. Flowers; and When God Isn’t Green: A World-Wide Journey to Places Where Religious Practice and Environmentalism Collide by Jay Weller. The Goddess in America: The Divine Feminine in Cultural Context, edited by Trevor Greenfield, is reviewed by Caroline Moran, while Shannon Connor Winward examines the poetry collection, Listening For Their Voices by Jennifer Lawrence. And Juli D. Revezzo digs into Witch’s Moonstone Locket by Marsha A. Moore.